I just came back from Japan, and the first ramen I have when coming back is Ramen Shop. To me, Tori Paitan (Chicken white broth) always feel "nutritious" when compressing all the chicken bone, meat, essences into one bowl of creamy tori paitan. However it doesn't seem that way anymore when trying the Paitan tonight at Ramen Shop. As most people will agree with me, Ramen Shop is very expensive, around $16-17 per bowl of ramen. (The price has increased over the year as well.) I feel very glad that ramen shop focuses on only 3 types of ramen each day to maintain their quality; however it doesn't feel like the case anymore. Although Ramen Shop became extremely busy after their bar extension; however the broth has obviously been "watered-down" since its grand opening. 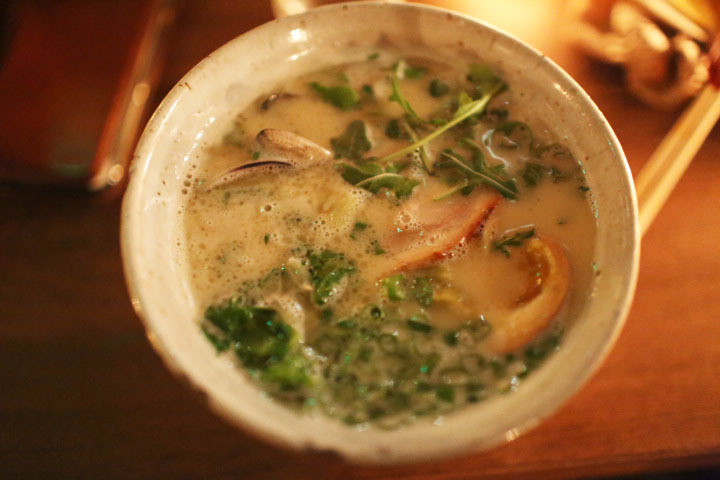 In the beginning, you can taste the full flavors of fresh ingredients from the broth. Their spicy and miso ramen also felt more like an authentic Japanese ramen one can find in Japan before. Now, it feels like the broth is mixed with water. it's actually very expensive, you made it short this time but I guess it's because there is not so much nice to say about it, even when that ramen looks very tasty. That ramen looks great, too bad it wasn't tasty. OMG that looks so good !